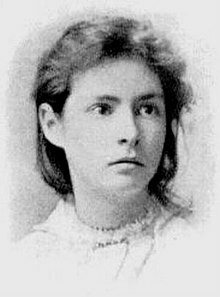 Olivia Susan "Susy" Clemens (March 19, 1872 – August 18, 1896), was the second child and oldest daughter of Samuel Clemens, who wrote under the pen name Mark Twain, and his wife Olivia Langdon Clemens. She inspired some of her father's works, wrote her own biography of him that Twain later published as part of his autobiography, and acted as a literary critic. Her father was heartbroken when she died of spinal meningitis at age twenty-four. Her biography of her father was published in 1988 in its entirety as Papa: An Intimate Biography of Mark Twain, a volume which also included a biography of Susy Clemens and her correspondence with her father. Susy Clemens was the inspiration for the character of Joan of Arc in her father's novel Personal Recollections of Joan of Arc. Born in Elmira, New York, Clemens was largely raised in Hartford, Connecticut, but went abroad with her family to England in 1873 and again in 1878–79. At age thirteen, she wrote a biography of her father that Twain later included in his Chapters from my Autobiography. The biography described her impressions of her father and her happy family life. Her father wrote: "I had had compliments before, but none that touched me like this; none that could approach it for value in my eyes." Like her father, she was interested in writing, and wrote her own plays and acted in them during her childhood and adolescence. Twain later described his favorite daughter as intelligent, thoughtful, sensitive and vivacious and said he had regarded her as a prodigy. "She was a magazine of feelings and they were of all kinds and of all shades of force; she was so volatile, as a little child, that sometimes the whole battery came into play in the short compass of a day," he wrote after her death. "She was full of life, full of activity, full of fire, her waking hours were a crowding and hurrying procession of enthusiasms ... Joy, sorrow, anger, remorse, storm, sunshine, rain, darkness -- they were all there: They came in a moment and they were gone as quickly. In all things she was intense: in her this characteristic was not a mere glow, dispensing warmth, but a consuming fire." He based the character of Joan of Arc in his book Personal Recollections of Joan of Arc on his eldest daughter as he remembered her at age seventeen. In the fall of 1890, Clemens attended Bryn Mawr College, where she was given the starring role of Phyllis in the play Iolanthe, began calling herself by her real first name "Olivia" and developed a close friendship with fellow student Louise Brownell that some biographers have speculated may have been romantic in nature. Clemens left the college after one semester, possibly because of her family's financial difficulties, because she found the studies too difficult, or because of her relationship with Brownell. As she grew older, she became frustrated with her father's fame, which sometimes left her in the shadows. She was annoyed by her father's reputation as a "mere humorist" and felt he should represent himself as a serious writer instead of just as a funny man. She was embarrassed when Twain performed the ghost story The Golden Arm for an audience at Bryn Mawr. She had begged him not to tell the story, thinking it too unsophisticated for her worldly classmates, and ran out of the hall crying when her father told the story anyway. She later accompanied her family abroad and attended schools in Geneva and Berlin, where she took language and voice lessons, though she was disappointed when a voice teacher told her she had a lovely soprano voice but didn't have enough lung capacity to project her voice from the stage. In Europe she was at loose ends, bored by her family's evenings at home and annoyed by her father's frequent temperamental outbursts. She wrote to her friend Brownell that she sometimes had trouble finding a reason for existence. She was also frustrated by society's refusal to see her as anything other than the daughter of Mark Twain. In Florence, the then nineteen-year-old Clemens became infatuated with a married Italian count. Her physical and mental health suffered, and she sought cures ranging from "mind cures" to hydrotherapy. Clemens chose not to accompany the family to Europe on Twain's lecture tour of 1895–96, citing seasickness and a desire to recover her health and become an opera singer. She stayed in Elmira, at the home of her aunt Susan Crane. In August 1896, while visiting her former home in Hartford, Clemens developed a fever that turned into spinal meningitis. Susy was moved to her family home, and stayed in her parents' mahogany bed, which had detachable angels on each post, a bed that she and her sisters had fond memories of playing with as children. Katy Leary, the family's Irish maid, took care of her, sleeping on a sofa in the room. Susy developed delirium, at one point clutching an article of her mother's clothing and crying because she thought her mother had died, and at another looking out the windows at the traffic and singing, "Up go the trolley cars for Mark Twain's daughter. Down go the trolley cars for Mark Twain's daughter." Eventually she lost her sight and lapsed into a coma. On August 18, 1896, she died at age twenty-four; her family was devastated. Clemens was buried in Woodlawn Cemetery in Elmira. The poem on her headstone was adapted from a poem called Annette by poet Robert Richardson: "Warm summer sun shine kindly here, Warm southern wind blow softly here, Green sod above, lie light, lie light – Good night, dear heart, Good night, good night." A children's book, The Extraordinary Mark Twain (According to Susy), features excerpts of Susy's biography of her father with smaller journal-style pages inserted between the main pages. "Mark Twain: Words & Music" is a double-CD that tells the life story of Samuel Clemens in spoken word and song and features segments about his family. The project was produced by Carl Jackson as a benefit for the Mark Twain Boyhood Home & Museum. The story line was written by Cindy Lovell and is narrated by Garrison Keillor with Clint Eastwood performing as Twain and Angela Lovell performing as Susy. Lystra, Karen (2004). Dangerous Intimacy: The Untold Story of Mark Twain's Final Years. University of California Press Ltd. ISBN 0-520-23323-9. ^ Pilkington, Ed (April 21, 2010). "Mark Twain manuscript reveals author's pain at losing his daughter". theguardian.com. Retrieved June 8, 2014. ^ "Susy Reviews Her Father's Performance". etext.lib.virginia.edu. Retrieved January 10, 2008. ^ "The Poem on Susy Clemens' Headstone". twainquotes.com. Retrieved January 10, 2008. This page was last edited on 12 October 2018, at 22:25 (UTC).